Greece has everything to offer the holidaymaker - relaxation, adventure and the chance to experience a very different culture. It enjoys great weather, beautiful and diverse landscapes, many scenic beaches and crystal clear waters. From the inspiring monasteries of Meteora to the ruins of Delphi and the numerous museums located all over Greece, you can delve into history and a unique ancient civilization. Athen's is one of the Mediterranean's great cities, displaying some of the world's most treasured relics. It's as fascinating and stimulating as the energy of the city is in the air. Taste of Athens 4 Days/ 3 Nights Daily Includes: 3 nights accommodations in the hotel of your choice, continental or buffet breakfast daily, half day city tour of Athens, dinner at a traditional Greek restaurant, private arrival and departure transfers. Book by December 31 and save $200 per couple on the package prices listed for departures between April 1 and October 21, 2016. Discounted prices start from $1,395 per person, available on April 1 & 15, 2016. Ancient history, beautiful blue islands, Mediterranean cuisine—experience it all in a small group of fellow travelers. 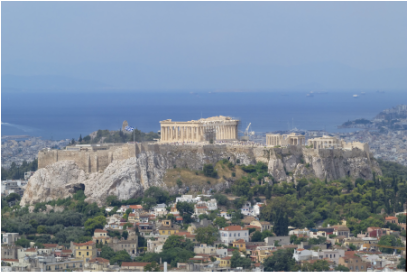 Explore Athens and see the Acropolis. Stroll through the cobbled streets of Mykonos, visit Delos and enjoy a glass of wine on the cliffsides of Santorini with a panoramic view of the Aegean below. Ancient history, stunning landscapes and famed ruins. Experience warm hearted hospitality as you cruise on a care free voyage to f discovery to fortified harbor towns, exotic cities, idyllic islands with classical temples, white washed windmills and blue domed churches.